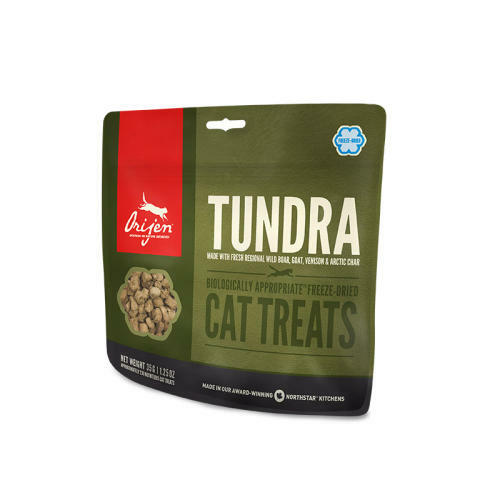 Indulging and nourishing the Orijen Freeze Dried Tundra Cat Treats are made in kitchens set against the backdrop of the beautiful Canadian landscapes where the Orijen team draw inspiration from Mother Nature. Sourcing the highest quality regional ingredients such as the steelhead trout delivered from Alverta Saskatchewan, ranched raised Elk from Morinville Alberta and cage free Quail from Nipissing Ontario Orijen use their passion for your cats welling being as a motivation to remain in touch will all of the food sources. In turn this influenced a range of foods which are sensitive to your cat’s natural diet which similar to the African Wildcat desire meat rich foods.